Irisin linked to Alzheimer's in Humans modeled and detected with Irisin ELISA Kit from Phoenix. Defective brain hormonal signaling has been associated with Alzheimer's disease (AD), a disorder characterized by synapse and memory failure. 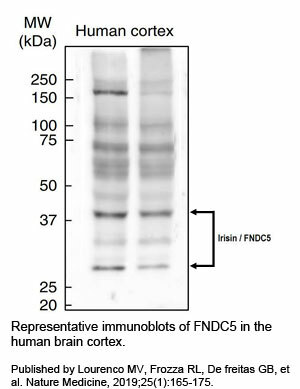 Irisin is an exercise-induced myokine released on cleavage of the membrane-bound precursor protein fibronectin type III domain-containing protein 5 (FNDC5), also expressed in the hippocampus. Here we show that FNDC5/irisin levels are reduced in AD hippocampi and cerebrospinal fluid, and in experimental AD models. Knockdown of brain FNDC5/irisin impairs long-term potentiation and novel object recognition memory in mice. Conversely, boosting brain levels of FNDC5/irisin rescues synaptic plasticity and memory in AD mouse models. Peripheral overexpression of FNDC5/irisin rescues memory impairment, whereas blockade of either peripheral or brain FNDC5/irisinattenuates the neuroprotective actions of physical exercise on synaptic plasticity and memory in AD mice. By showing that FNDC5/irisin is an important mediator of the beneficial effects of exercise in AD models, our findings place FNDC5/irisin as a novel agent capable of opposing synapse failure and memory impairment in AD. This publication used the irisin EIA kit (EK-067-29) from Phoenix Pharmaceuticals for CSF measurement in Alzheimer's patients. 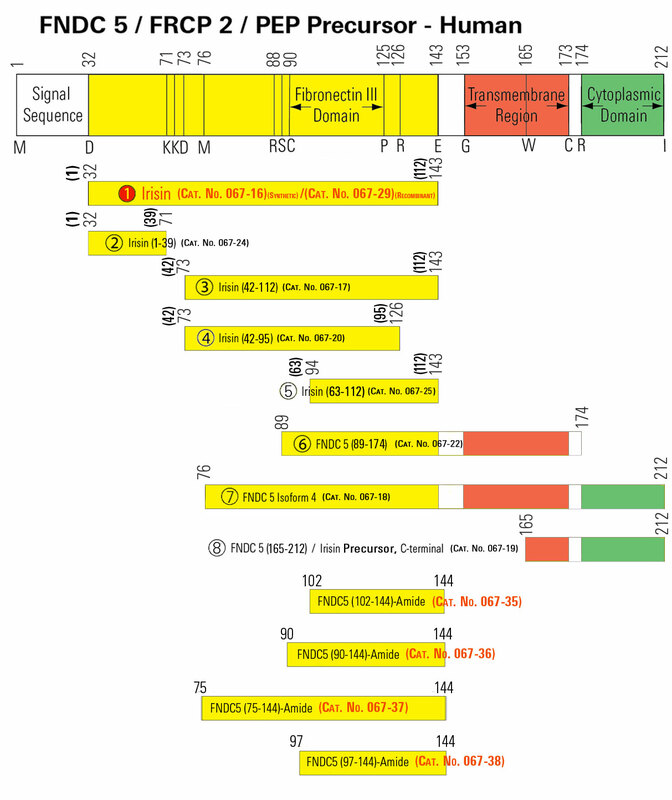 CNS FNDC5/irisin is reduced in A.D.
Left. Summary quantification of irisin in the CSF of AD and LBD patients compared with healthy controls or MCI patients (N = 26 controls, 14 MCI, 14 AD, 13 LBD patients); *P < 0.05, two-sided one-way ANOVA followed by Holm–Šidák post-test. Center values are expressed as mean ± s.e.m. Right. Plasma levels of irisin in AD and LBD patients compared to healthy controls or MCI patients (N = 26 controls, 13 MCI, 13 AD, 14 LBD patients). from article. Lourenco MV, Frozza RL, De freitas GB, et al. Exercise-linked FNDC5/irisin rescues synaptic plasticity and memory defects in Alzheimer's models. Nat Med. 2019;25(1):165-175. 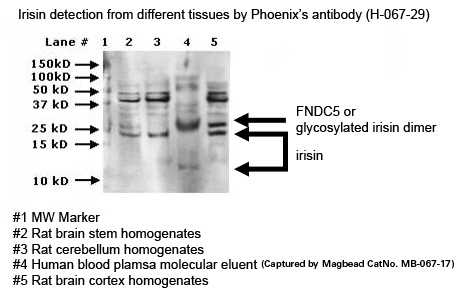 Phoenix's Irisin ELISA kit is validated by measuring the CSF of AD subjects. This Irisin-Ab from Phoenix's kit binds to tissues and other Vendor's Irisin as well. 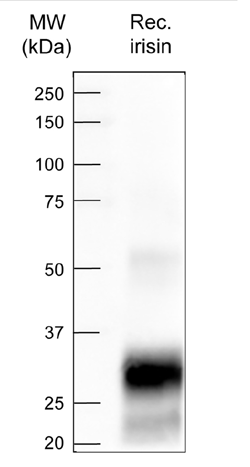 The antibody used in Phoenix's irisin Elisa kit (EK-067-29) recognizes recombinant irisin expressed in CHO cells (Adipogen).